911 Emergency Shower/Eyewash Valves are specifically engineered to provide tepid water to emergency showers and eyewashes. Tempered water promotes safe and effective usage of a drench shower in an emergency situation. 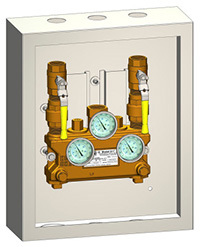 Lawler's 911 Valve contains two independent thermostatic elements in order to provide tepid water in the event of a thermostatic failure. The Hi-Low GPM range of 2 to 60 gpm @ 30 psi is sufficient for a single eyewash or several drench showers, and meets ANSI Z358.1-2014 voluntary standards. 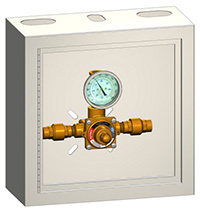 The 911 valve can be installed into an existing emergency shower application and is easily tested and repaired. The 911 is available with thermometers, shut-offs, cabinet assemblies, and a choice of rough bronze or white chrome finish. When safety and reliability are required, specify the Lawler 911 Series. 911E Emergency Shower/Eyewash Valves are specifically engineered to provide tempered water to emergency showers and eyewashes. Tempered water promotes safe and effective usage of a drench shower in an emergency situation. 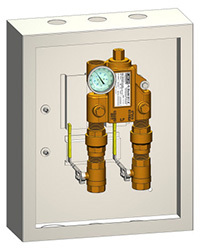 Lawler's 911E Valve contains one thermostatic element in order to provide tempered water in the event of a thermostatic failure. The Hi-Low GPM range of 2 to 25 gpm @ 30 psi is sufficient for a single eyewash or single drench shower, and meets ANSI Z358.1-2014 voluntary standards. 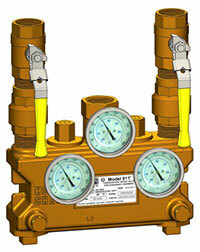 The 911E valve can be installed into an existing emergency shower application and is easily tested and repaired. The 911 is available with thermometers, shut-offs, cabinet assemblies, and a choice of rough bronze or white chrome finish. When safety and reliability are required, specify the Lawler 911 Series. 911E/F Emergency Shower/Eyewash Valves are specifically engineered to provide tempered water to emergency eyewashes. Tempered water promotes safe and effective usage of an eyewash in an emergency situation. 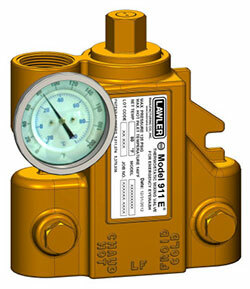 Lawler's 911E/F Valve contains a by-pass in order to provide cold water in the event of a thermostatic failure. 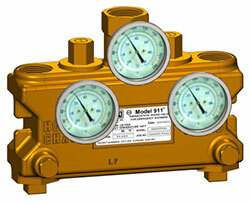 The GPM range of 2 to 7 gpm @ 30 psi is sufficient for a single eyewash, and meets ANSI Z358.1-2014 voluntary standards. 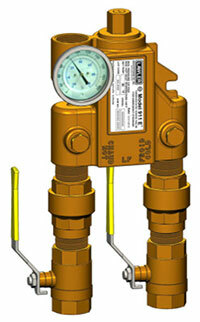 The 911E/F valve can be installed into an existing emergency eyewash application and is easily tested and repaired. The 911E/F is available with a thermometer, cabinet assemblies, and a choice of rough bronze or white chrome finish. When safety and reliability are required, specify the Lawler 911 Series.